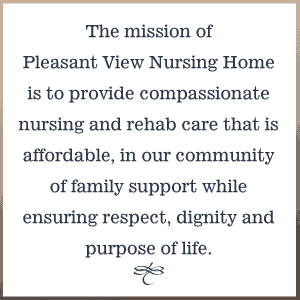 Pleasant View Skilled Nursing & Rehab is a 110 bed skilled nursing facility located in the rolling hills of southern Green County, allowing residents a picturesque view of the rural landscape. We’ve provided 24-hour rehabilitative, long term, and dementia care since 1969. Pleasant View has a rich history that extends back to the 1860’s; the first poor farm for Green County was purchased in 1861 in the town of Mount Pleasant. The first ledger entry is dated February 1st, 1883. Originally built to serve the needs of Green County citizens who were poor and mentally infirm, the facility was called the “Green County Asylum”, “The Poor Farm” and the “Green County Mental Hospital”. In 1969, new construction of our present facility was completed; North wings were added in 1973. Pleasant View was the original “county farm” and for many years served as the home to the indigent, the elderly, and the mentally handicapped. Originally more than 300 acres, it was virtually a self-sustaining farm complete with a county-owned dairy herd, chickens, vegetable gardens, crop land, and orchards. Residents worked in the bakery, the laundry, the kitchen, and the farmstead barn. They canned vegetables, and made their own butter. The first Green County “barn-raising” was at the Pleasant View barn. The barn also displays the first Green County Barn Quilt, Whirligig, which was painted by Pleasant View residents. Pleasant View is fortunate to have a skilled, dedicated employee base. We are grateful to our volunteers and local groups who selflessly enrich our residents’ daily lives including the Friends of Pleasant View Foundation. Pleasant View is overseen by the Green County Board of Supervisors, the Pleasant View Oversight Committee and also receives the generous support of the Green County community through a valued reputation and financial resources.